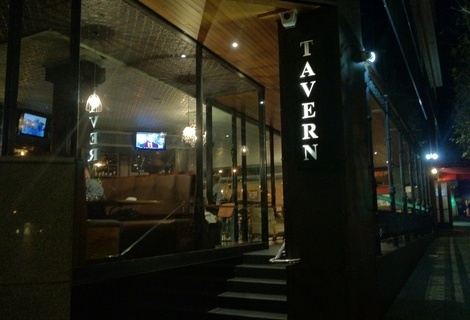 Spacious modern pub in West Perth - great food and value. 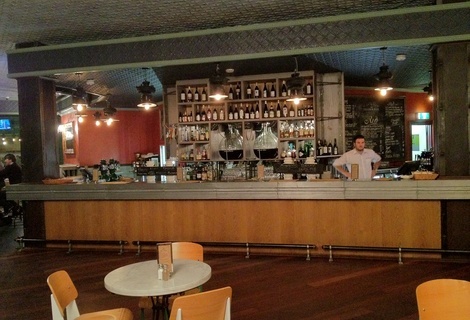 The Brown Fox was reviewed on Tuesday 10th July 2012 18:09 by Richard. It had been a while since I had ventured into West Perth for a drink. 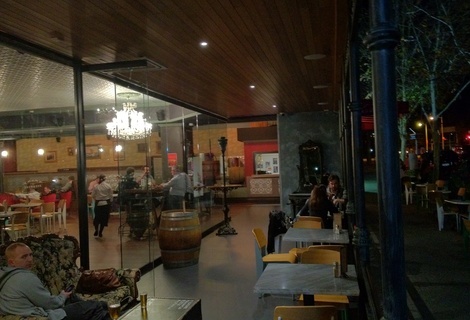 Normally I go straight past on my way to Subi or back into the city but recently a friend, who works close by, recommended we head up to The Brown Fox on Outram Street. Formally Onyx Bar, which in its hay day, was considered one of Perth’s sexiest bars with overly excessive decor (including an indoor pond) and a regular line up of quality DJ sets. A clear lack of maintenance and unwillingness to change ultimately resulted in Onyx bar shutting its doors. The space has since been revamped and the new fit out looks amazing, chewing gum stained carpets have been swapped out for wooden floors and the entire bar now has a great open feel to it. We ordered a couple of beers up at the bar and sat down towards the back corner, which was a great vantage point to take in the whole bar and get a good sense of the vibe the place had going. It was pretty busy by the time we got there, but the wide open spaces did a good job of making it feel spacious and uncramped. It’s fairly obvious that The Brown Fox is not your average pub, which was also reflected in the menu. There were a few pub standards (steak sangas, burgers etc) but most of the menu was comprised of more interesting selections; duck and mushroom pie, suckling pig, terrine of the day and the list goes on. I decided to go with the steak sandwich and Matt the duck and mushroom pie. I went up to the Bar to order and there was a slight problem, much to Matt’s dismay they were fresh out of duck. 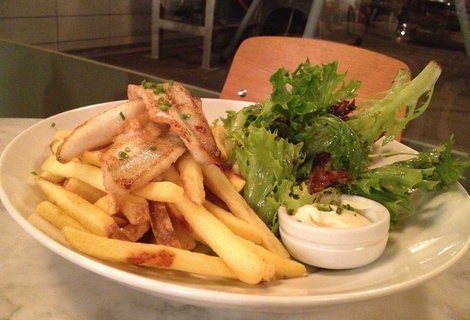 So he opted for the grilled whiting with salad and frites. Service was quite good, both bar and wait staff were friendly enough and good at their jobs. Our food came out within 10 minutes of ordering which was impressive but a bit worrying at the same time. In any case it was presented really well and very tasty. 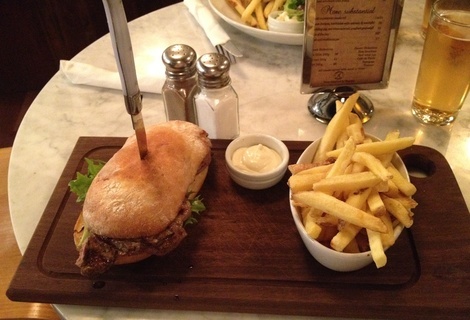 My steak sandwich was brilliant, the steak was cooked a perfect medium and was a decent size. It had a good amount of relish and salad and the hand cut chips on the side were great, a refreshing change from stock standard “oven-style” frozen chips a fair number of pubs serve these days. The whiting was also quite good, the fish was cooked well and had a good flavour. The only gripe Matt had was a bit of false advertising on the menu, it says it comes with a “salad”, however, it really just comes with some dressed lettuce leaves. Nothing was wrong with them but it definitely wasn’t a salad. We hung around for a couple more reasonably priced pints of tiger ($10) and I couldn’t help noticing the two large wine decanters behind the bar. If I hadn’t been driving we would’ve hung around for a bit longer and tried a few wines. There’s a fairly large range of wines on offer but they do tend to be on the pricier side of average, which was not the case when it came to food. 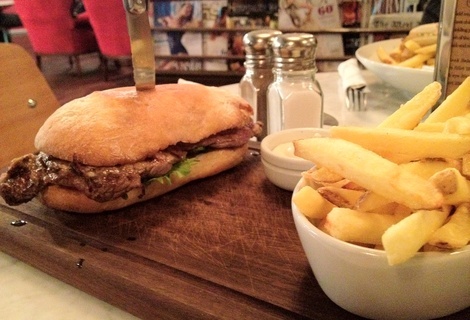 Both the steak sandwich and the whiting were $20 each and given that they were not only tasty but fairly sizey portions, the value is really good. Reasonably priced and tasty food, good decor and atmosphere, friendly service and a good range of food and drinks – what a winner! If you haven’t visited The Brown Fox yet, I’d strongly recommend that you do. On the way out I noticed that they do $15 lunch specials during the week (Monday – Thursday), there’s a good chance I’ll be making my way up from the city for a quality mid-week lunch very soon.